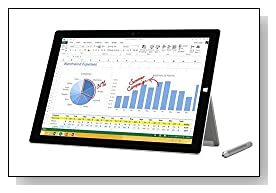 Microsoft Surface Pro 3 MQ2-00001 is a large 12 inch screen tablet with a ClearType Full HD display, a 4th generation Intel Core i5 processor, 4GB memory, 128GB Solid State Drive and 9 hour battery life. It gives you the flexibility to turn it from a tablet to a laptop instantly with the multi-position kickstand, comes with the Surface Pen to give you the ability to write on the screen naturally (and even sign documents) and the Palm Block feature to allow you to rest your hand while you’re writing. This version of Microsoft Surface Pro 3 comes with the fast and powerful Haswell Intel Core i5-4300U processor (3 MB Cache) at 1.9 GHz speed that goes up to 2.9 GHz with the turbo boost function, 4GB LPDDR3 SDRAM memory to be able to multitask several things at the same time, 128GB SSD for faster boot-ups and a much snappier performance overall and the 64-bit Windows 8 Professional operating system. Intel i5-4300U is the ultra low voltage processor offering super power efficiency (15 watt max power consumption) and has the hyper-threading technology to handle up to four threads in parallel for smart four way processing. You won’t have any problems running different software, including Microsoft Office Suite and do everything you do on a powerful laptop. Even if you are not very keen on Windows 8, it seems to be a whole new experience on the Full HD touch display of the Surface Pro 3. ClearType Full HD screen is a 10-point responsive multi-touch that supports multiple gestures, has the 3:2 image aspect ratio- optimised for Windows 8, 2160 x 1440 native pixel resolution with great colour accuracy and sharp images and Intel HD 4400 graphics card that is faster than the HD 4000 and a bit slower than HD 5000- great for everything but advanced games. It has the Dolby Audio, stereo speakers and microphone for great sound quality and two 5 mega pixel webcams. The Surface Pen feels like a proper pen, gives you the ability to draw, sign documents, mark up presentations and take notes at meetings. 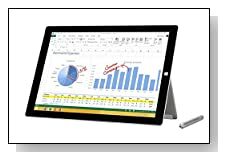 Wrapped in magnesium sleek frame with silver coloured back Microsoft Surface Pro 3 is the lightest and slimmest member of the Surface Pro family with a weight of just 1.8 pounds with dimensions of 0.36 x 11.50 x 7.93 inches, which make it very portable. With the new hinge it can go any angle down to 150 degrees, using friction that feels very sturdy to hold it in its place Connectivity options are USB 3.0 port, Mini DisplayPort, Headphone/microphone combo jack, 802.11a/b/g/n wireless, Bluetooth 4.0, microSD card to let you increase the storage capacity for photos and videos and front and rear webcams(5 MP), optional Type Cover keyboard with responsive touchpad. Conclusion: Light and thin Microsoft Surface Pro 3 gives you the power and performance levels of a laptop while giving you the flexibility to use in both tablet and laptop modes (kickstand is a great addition that gives you flexibility). It is easy to set up and to use and navigate, comfy to hold, pretty to look at, extremely convenient and functional with specs that are quite high for both a tablet and a laptop, feels solid and durable, offers good sound quality and sharp graphics- comes with many features making it suitable for business, school or home use. There is only one USB port and a miniDisplay port which could well be another USB 3.0 port and the Surface Pro 3 Type Cover keyboard is optional at an extra cost but may well be worth it. This version of Surface Pro 3 presents overall great value with definitely better features and specs as well as a larger screen than the previous Surface Pro 2.